The main attraction of hebes for me is their evergreen foliage. The variety of leaf sizes and shapes is incredible. When dealing with hardiness, generally the smaller the leaf, the hardier the plant. 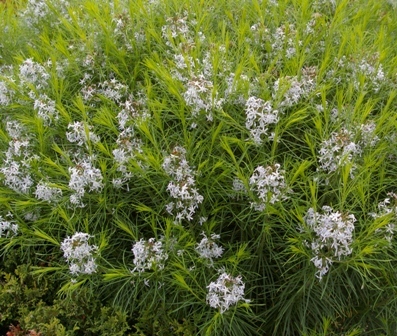 It has also been found that hebes with gray leaves tend to survive drought better than others. Some hebes have foliage that changes color in the colder months to provide further winter interest. The red foliage darkens in winter. Sun- Grow in full sun to open shade. Hebes do well in deciduous shade so that they can get sun in the winter but dappled light in the summer. When grown in too much shade they tend to get leggy and one sided as and stretch toward the light. Soil- Any decent semi well drained soil will do. I have not found them to be too picky as long as they are not underwater. They do grow much quicker in well amended soil. I have a downspout that empties onto this all winter and it has put up with it. I would not recommend this, but it still hasn’t killed the plant. Water- Hebes are not excessively drought tolerant on the whole. Certain varieties are more tolerant that than others, but most like bi-weekly water during the summer. When grown in part shade you can get away with a lot less water. Whipchord types are less drought tolerant than others. I have had this survive in very dry conditions, and never had winter damage. Pruning- Cut out dead material after heavy frosts are past. Prune for shape in early spring and give some fertilizer or compost after to feed new growth. Though this might reduce flowering in certain varieties, I don’t want to risk late season due to the likelihood of young growth being damaged in the winter. Propagation- Hebes root very easily from cuttings. Take semi-hardwood cuttings in August to October. Leave two nodes on top and one below soil level. They can also be rooted in water. This is a great way to protect against winter losses. They can also be done through layering. Pests and Disease- Some deer eat hebes and some do not. They are currently one of their favorites at Joy Creek. Septoria leaf spot (black spots on the leaves) is more of a problem in nursery settings than the garden. I would accept a little on a plant I purchase, but avoid anything that is too ugly. 1.Pick the right one. Some cultivars seem to croak every year while other similar looking ones just keep on trucking. An ice storm is no match for Hebe ‘Greensleeves’. 2. Plant in the spring. This allows the plant to establish before winter but this also means you have to water the first summer. 3.Give all hebes some water when it hasn’t rained in months. A good deep soak goes a long way. They are from New Zealand, not the Mediterranean. I admit to babying mine a little, but there is a difference between surviving and looking good. 4. Site your plant where it is protected from cold winds. The Arctic blast coming down the gorge is death for hebes. It dries out the fleshy evergreen foliage and they cannot survive. Plant next to wind breaks or on the west side of tree, hedge, or house. Salty ocean breeze does not seem to effect them. You can grow all the hebes you want at the coast. I kept this alive by planting it out of the wind on the west side of my house. It survived 12 degrees with a little help from a garbage can. 5. When it gets cold quickly in November and early December give them a little extra protection from a bucket or fir boughs. Once they have been through a good frost they are unlikely to get damaged unless it is below 15 degrees. Give the same protection if there is a late frost. They often just need to be a little warmer and out of the wind. A little protection goes a long way. Don’t give up on hebes just because one died on you, there are great ones out there. This entry was posted in Gardening Advice and tagged Hebe, Hebe blue mist, hebe corriganii, Hebe for Portland, hebe pretty in pink, hebe western hills, Hebes for Northwest. Bookmark the permalink.